Perfect for any type of celebration! The perfect decorating kit for just about any celebration! 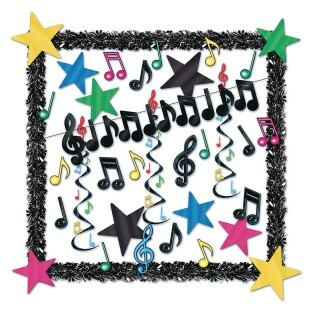 Kit includes 2 black metallic festoons measuring 15’ long, 1 foil music notes streamer measuring 6’ long, 3 music note whirls measuring 30” long, 12 assorted size neon musical notes silhouettes measuring from 12” to 21” long and are printed both sides on boardstock paper, 7 black plastic musical notes measuring 13” long, and 10 assorted color and size foil stars that measure 9” to 12” long.